Bode Miller was the clear goat of the 2006 Torino Winter Olympics. America's best skier (possibly of all time), Miller came into the Olympics expected to medal in all of the five events that he entered. He became infamous in the days leading up to the competition by making repeated claims that he didn't care if he won, that he just wanted to have a good time, and by admitting that he skied drunk. 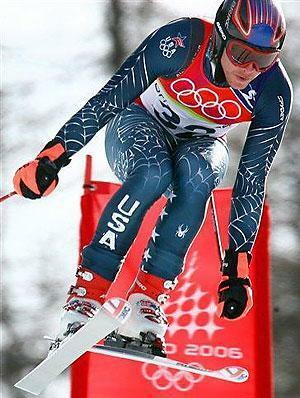 After winning two medals in Salt Lake City (2002), Miller was the "darling black sheep" of American skiing. Coming into Torino, though, he was outspokenly apathetic: “Whether somebody wants me to get five gold medals or whatever it is, I sort of feel like they are all other people’s concerns and issues, not really mine. ... I don’t really care what everybody else says,” he said. For those Olympic fans out there, you know what happened. He won zero medals, and took major heat for saying the same thing after the Olympics: "I don't care" (my paraphrase!). Pilloried for four years, Miller was dismissed this year. Called "a clown" by much of the sports media, he was completely overshadowed by Lindsey Vonn coming into these Vancouver games. In fact, he quit the U.S. ski team shortly after Torino, training whenever he wanted. Less than a year before this year's Olympics, Miller discovered in himself the desire to ski for his country. He applied for reinstatement, and was granted it. (I'm sure it didn't hurt that he remains one of the best skiers in any downhill discipline in the world). In an Olympics when all attention is focused on Vonn and Miller was all but forgotten, all he he has done is rack up three medals (a gold, silver, and bronze) through four events. As for the Olympics, he added, it’s not about obsessing over medals — and certainly not about obsessing over other people obsessing about your winning medals. As a teenager, Miller showed the sky’s-the-limit-potential he first delivered on with a pair of silvers in Salt Lake City eight years ago. But that success may have actually hurt him, setting him up for the huge fall of 2006, when other people’s expectations made him surly and, worse, almost defiantly non-competitive. And there you have it: Pressure from the outside "made him surly and...defiantly non-competitive." It was only when he was forgotten about, when the pressure was released, when he was branded a clown, that his performance reached his potential. I don't think it's too much of a stretch to say that Miller's performance was freed when he was seen for what he was: an over-hyped clown. Miller could, this year, own his clownish nature and ski without feeling the pressure to be the cold-blooded Olympic assassin we all wanted him to be, but which he never was. Miller's story serves as a highlighter on our repeating message of judgment and love, critique and grace, pressure and release. It is when pressure is released, when the law is lifted, that "performance" can meet expectation.